Platform: Volkswagens groups PQ35 architecture. 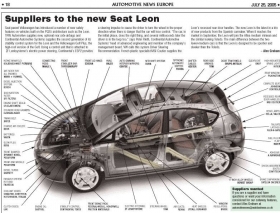 Production: Seat will build about 85,000 Leons this year, according to PricewaterhouseCoopers AUTOFACTS. Seat says production volume will depend on market demand. Seat parent Volkswagen has introduced a number of new safety features on vehicles built on the PQ35 architecture such as the Leon. TRW Automotive supplies new, optional rear side airbags and Continental Automotive Systems supplies the second generation of its stability control system for the Leon and the Volkswagen Golf Plus, the high-roof version of the Golf. Using a control unit that is attached to ZF Lenksysteme's electric power steering, Continental's ESP2 provides a steering impulse to cause the driver to turn the wheel in the proper direction when there is danger that the car will lose control. "The car, in the initial phase, does the right thing, and several milliseconds later the driver is in the loop too," says Peter Rieth, Continental Automotive Systems' head of advanced engineering and member of the company's management board. VW calls this system Driver Steering Recommendation. French plastic specialist MGI Coutier supplies the Leon's recessed rear door handles. The new Leon is the latest in a trio of new products from the Spanish carmaker. When it reaches the market in September, the Leon will join the Altea medium minivan and the similar looking Toledo. The main difference between the two lower-medium cars is that the Leon is designed to be sportier and sleeker than the Toledo.